Who doesn’t want to have a beautiful lawn or a garden right in front of their house? The dreams seem to be very attractive but the maintenance of the gardens comes free with having a garden. Cutting the extra branches, uprooting the dangerous shrubs, preventing from overgrowing and many other things should be constantly checked. But if your garden is big, then the whole task seems tiring. So, garden scooters come to play the most important role. Having the ability to move from one place to another, these even have storage options. Thus, one does not need to travel multiple times to get equipment. However, in the sea of harmful and counterfeit products, how to identify a truly beneficial brand? In our garden scooters review, all your doubts are answered. And we help you to decide on what’s best. Sitting in an uncomfortable position for hours just on the support of your legs? Well, it puts a lot of strain on your back, hips and thigh muscles. 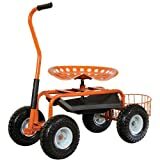 This nice garden tractor scooter gives you a great sitting platform for doing all your garden chores. And it is perfect to be used for multiple other purposes. 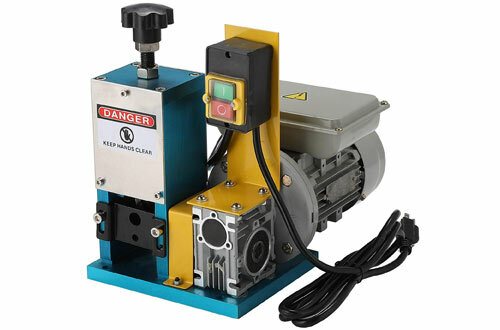 For extra durability, it has a very sturdy and strong tubular frame made from high-quality steel. Moreover, it supports you well and would last for a long time. In fact, the frame is so strong that people with a healthier build won’t have any problems sitting on it. 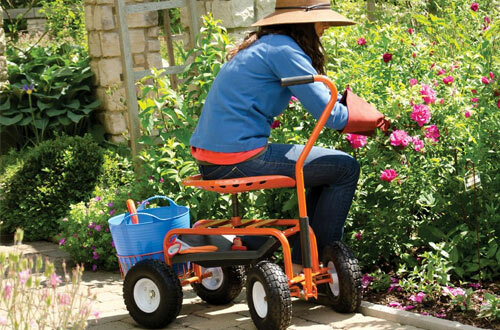 With 400 pounds of weight capacity, it can hold you and your heavy gardening tools. Big 10-inch tires have a great grip and best for traction on all kinds of terrain. The big size helps it to overcome potholes and contours on rough fields very easily. 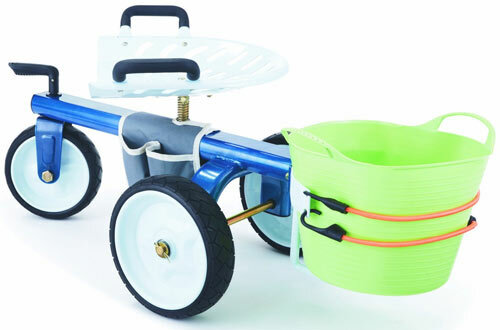 It also has a bucket basket which can hold a large 5-gallon Tubtrug without any issues. Powder coated frame prevents corrosion from exposure to elements. Needs just three common tools like slip jaw pliers to assemble the scooter. You can adjust the height of the seat from a low position of 16-inches to a high position of 19-inches. 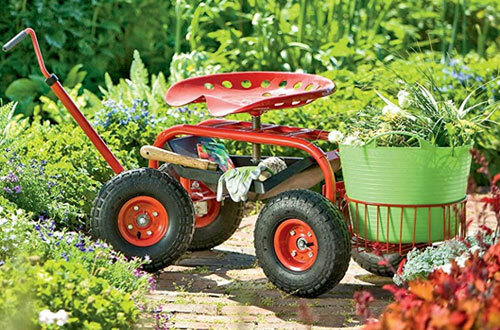 Your Sunnydaze Decor garden cart is made from a high-grade tubular steel frame. 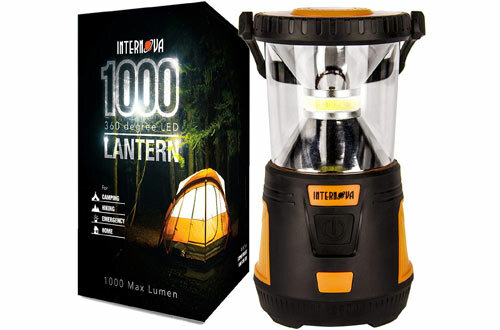 With robust construction, good engineering and sturdy design, it has an impressive weight limit. Thus, it can support individuals who weigh up to 225 pounds. The seat is wide and large to support you. Plus, has enough room so that you don’t slip off while tending to the plants or fixing the fence. However, the garden scooter swivel seat is capable of rotating full 360-degrees. 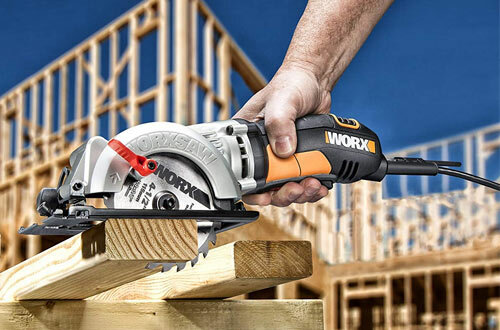 Having its swivel function, you can easily access all the tools around you. One can cover more working area with less effort. The frame is generously powder coated to shield the cart from rusting and extends its life. You even get a steering handle that can be extended. 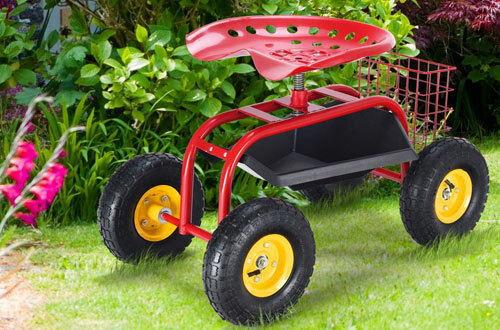 So you don’t have to get into an uncomfortable position while drawing the cart and take it around the garden. You won’t be limited by a specific height either. The seat is meant to lift up from 16 and a half inches to 22-inches. Hence, you don’t have to get up from your seat for reaching higher positions. Utility basket lets you store multiple useful things like wire cutters, tape, crowbars and other tools. Axles are super tough to handle the uneven terrain. Steering handle is extended from 20-inches to 29 and a half inches. 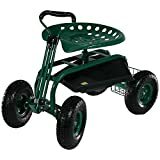 Gorilla Carts brings to you one of the most advanced and premium garden cart you can find on the market. The frame is very unique since it implements a three wheels design instead of four wheels. This helps you to turn more easily with the single front wheel. On both sides of the wide garden scooter seat, you have two handles. As a matter of fact, you can use for support while doing your gardening chores. Furthermore, the tires are very unique since they are solid and require no air. So they won’t go flat while you are performing your chores. Also, the hardware used in a scooter is simply rust-proof. The seat has a rotating function and adjustable height. Certainly strong fabric with pockets under the seat to store your tools. Bungee cords at the back can indeed hold a large bucket. Flat tyres are a huge problem in the middle of your work. 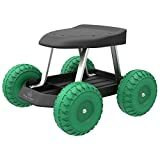 Since you have to carry the cart back and waste a lot of time and effort on fixing or replacing the tyres. This cart has no such problems and also has grilled storage at the back to hold your bucket. 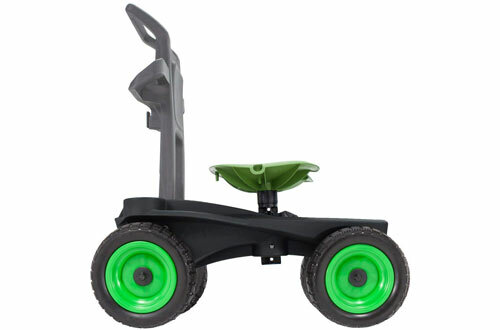 Further, the garden scooter with swivel seat features a tractor style. Now, you can have full control over the cart with the use of handle attached to it. The seats are adjustable from a height of 16-inches to 20-inches. Finally, the steering helps in functioning well in all sorts of terrain. Tyres are made from polyurethane. Has a massive weight capacity of 400 pounds. The storage section can hold up to 5 gallons of essentials. 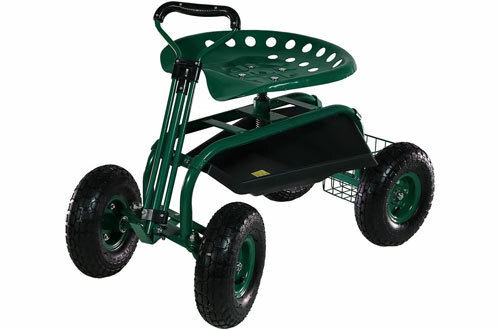 Certainly, a simple and innovatively designed garden cart that has a wide 17.5-inches seat to prevent you from slipping. Its large 10-inch tyres really help you to move this around with ease. Also, it makes a great portable seat for various purposes. 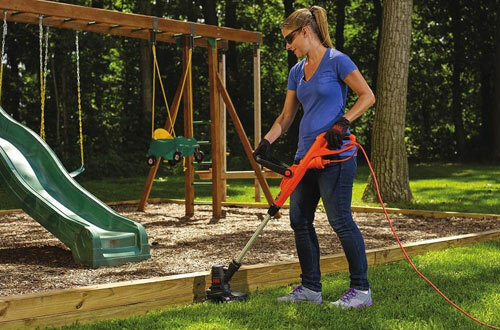 You can use it while gardening, washing your car or doing other stuff where maintaining a lower position is required. Plus, it has a heavy-duty construction of steel and the seat has 360-degrees swivelling capacities. Even the tray is polypropylene-made for adding to the longevity factor. The high carrying capacity of 300 pounds. 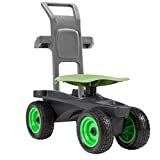 One of the most robustly constructed garden scooter in the market with the most bang for your buck. It is made in the United States and has a back support that extends quite a lot behind the seat. This gives you back a lot of relief and the top handle makes pulling or pushing the scooter an effortless job. It has tires which won’t go flat. Moreover, the extensive patterns make them roll with ease in the garage, garden and everywhere else. 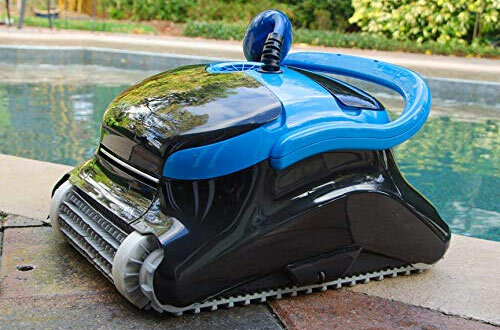 Cleaning this garden mobility scooter requires no expertise. One cannot stop getting the benefitted cause of its ergonomic design. Seat swivels and height can be changed from 15-inches to 19-inches. Bucket clips enable you to attach 5 or 3-gallon buckets. With this carts rotating seat that can turn full 360-degrees, you can quickly switch positions and work in any direction you want. You get a reliable and sturdy frame that is made from one-inch thick tubular steel. Thus, it gives a high weight carrying feature. You can easily use this cart as long as you weigh 300 pounds or less. Other than your garage or garden, you can also use it in the home for painting the lower portion of the walls. 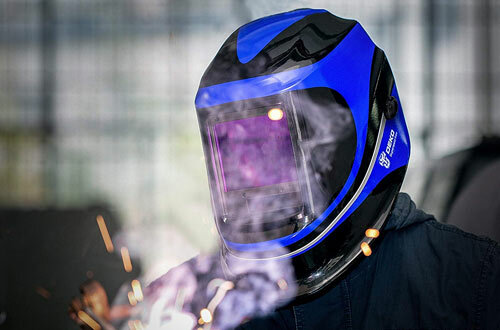 Furthermore, the heavy-duty framing features trustworthy 1-inches steel tubing. It is certainly coated sufficiently to resist adverse effects. Weighs very less compared to its size, just 27 pounds. 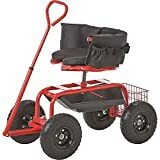 Most garden carts and scooters have a hard seat. It makes them very uncomfortable if you have to spend a long duration on it. Kotulas has made a garden cart to solve that problem. Firstly, it comes with a swivel-enabled seat that has adequate cushioning to seat you in luxury. The frame on this cart has an interesting inverted U design which gives it more strength in a compact form. Apart from the tough metal construction of the frame, it even has a protective coating. As a matter of fact, it shields it from rust and corrosion. However, you also get a T-turnbar handle. 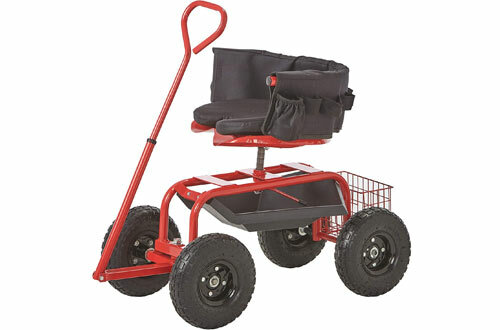 It is used to guide the cart while you are pulling it at your backyard or on the road. It is connected by an axle of the front wheels and is used to change directions easily. A metal grill basket at the back to store various gardening tools. The tray under the seat helps you carry a lot more stuff than you were able to before. The seat has loops or straps at the back to hold tools and provide you with easy access. It’s high time that you take a break from standing for hours in the garden while twisting, bending and stretching. This just makes you tired easily and makes gardening a chore instead of a relaxing experience. Manufactured by Pure Garden, it lets you have a leisurely and enjoyable experience in the garden. With over 121-square inches of seat space, you will have a comfy position to do everything. Thus, nothing will remind you of your leg fatigue. 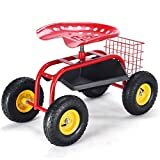 Moreover, you get a large tray underneath your seat to store garden supplies and equipment like fertilizers and hand shovel. The cart is made out of stainless steel and plastic keeping it strong, yet lightweight. 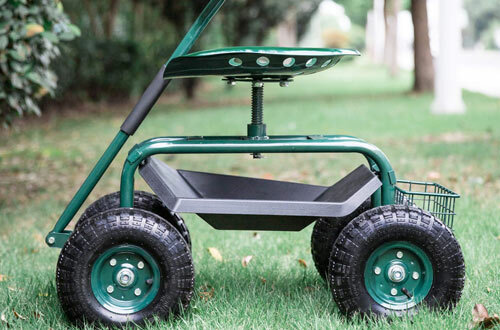 Having 200 pounds of carrying capacity, you get exceptional portability around your garden with this cart. Even the wheels have strong plastic construction which keeps it immune to leaks like air tyres. They have a strong grip over the ground and can move smoothly over most terrain. Black and green colour combination looks appealing. Weighs around 7 and a quarter pounds, quite low than most other brands in the market. Has an appropriate height of 13-inches. 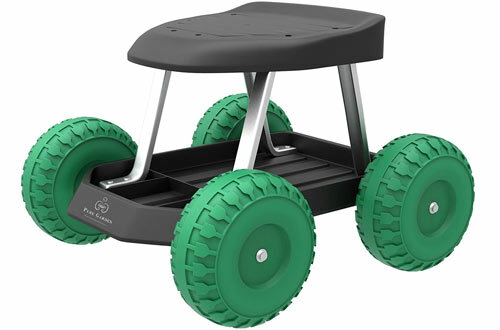 Peachtree has manufactured this cart from sturdy metal and high-quality plastic. The metal frame has great design and immense durability to last you for years heavily using it. 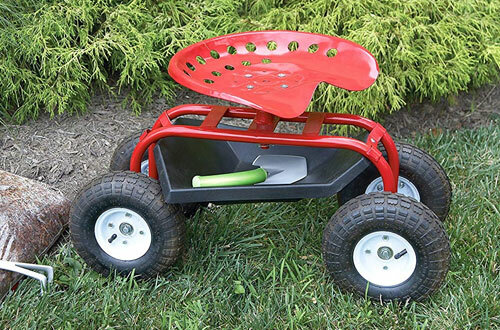 Other garden carts might have a smaller seat to cut back on the production cost. But this cart has a large seat. As a matter of fact, it supports your bottom adequately and lets you work in great comfort even after long periods of time. The 17-inch wide seat is also very versatile since it can swivel around and has height adjustability functions. So when you need to reach a bit higher you can just change the seat height. Moreover, one can turn full 360-degrees around you with these amazing features. The wheels on this cart are great as well. They have pneumatic tyres and have extensive patterns on the surface to increase traction with the ground. You get a basket to store your tools and if you need even more space you can use the tray under the seat. Can support up to 310 pounds. Wheels have a diameter of 10-inches. 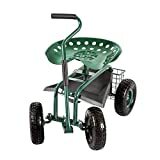 Shape the garden and maintain its beauty, the garden storage cart and scooter help in an organized activity.